Gravity Sand Filters Barton Firtop Eng Co Ltd Gravity Sand Filter. See 'Kleerflo' Self-Cleaning Filter page for more details. 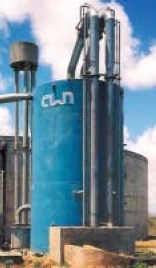 The self cleaning autonomous valveless Gravity Sand Filter consists of a 3-compartment vertical steel tank divided into a backwash storage compartment, a filter bed compartment and a filtration collection compartment. It operates entirely without any outside energy supply, whereby water is clarified solely throughout the process of sand filtration. Backwashing occurs on the loss of head principle as described below. The design eliminates the need for backwash pumps and valves. The backwash storage compartment is designed to hold an adequate amount of backwash water. It always fills to the same height, thus providing a constant backwash volume. Also, as the level of water in the backwash compartment drops, the backwash rate diminishes so that the backwash rate actually starts at about 44m/h and gradually slows down to 30m/hr at the end. Extensive experience with this diminishing backwash rate has indicated it to be completely satisfactory for cleaning the filter bed. The high initial flow rate provides greater initial turbulence to wash the sand. The lower flow at the end of backwashing permits the bed to settle evenly and smoothly. The filter-bed compartment contains fine filter sand. Unique strainers uniformly collect the filtered water and distribute the backwash water without the need for any gravel layer. The unit operates to a mere 1,2 to 1,5 metres head loss. Experience has shown that under these conditions a surface wash and/or an air backwash is not required to break the surface mat to achieve effective regeneration of the filter bed. Units are available for flows up to 1,130m3/hr through a single vessel uo to 12m diameter and a double bed version is also available up to a maximum flow of 2,260m3/hr. Using double bed units has advantages in certain installations relating to space saving, transport and instantaneous discharge while backwashing. • No backwash pumps required for operation. • No electrical requirements for operation. • Stores own reservoir of backwash water..
• Simple operation - can be fitted & forgotten. • Minimum sand loss or carryover occurs. • Ideal for use in zoned hazardous areas. • Minimum maintenance & operator involvement. • Human error factor is eliminated. • Double bed version available, space & cost saving. Click here, to download Brochure.